Saudi Prince Mohammad bin Salman, heir to the Saudi throne, kicked off a two-week tour of the U.S. with a meeting with President Donald Trump which highlighted the close relationship the administration shares with the Kingdom that began with the president’s trip to Saudi Arabia shortly after his inauguration. Part of that relationship is centered on restoring stability in a Middle East riven asunder by the Iranian regime which has plunged three countries into war in Syria, Iraq and Yemen. The latter of most concern to the Kingdom because of its common border and a hail of Iranian-made rockets and mortar shells falling on it. The Saudi Crown Prince has moved quickly not only to take the reins of foreign and defense policy for the Kingdom, but also to move it into a more progressive era by instituting changes and reforms especially aimed at empowering Saudi women in culture, politics and the economy. Changes that are anathema to the mullahs in Tehran and evidence of the growing divide between the two countries. Of course, that has not stopped the Iran lobby, especially the National Iranian American Council, from consistently attacking Saudi Arabia and attempting to portray it as a bloodthirsty state sponsor of terrorism. Ironically, while Iran occupies almost permanent status on the U.S. State Department’s target list of state sponsors of terrorism, Saudi Arabia has moved quickly to identify and eradicate radicalized Islamic elements in its society, especially those adhering to the Iranian regime’s principles. But that hasn’t stopped the NIAC’s Trita Parsi from issuing a statement attacking the Crown Prince because of his public statements warning of spreading Iranian extremism. Parsi and the rest of the Iran lobby have consistently banged the war drum in order to stoke fears, but the source of that tension has always been blamed on someone else rather than the mullahs in Tehran; be it the U.S. or Saudi Arabia or Israel, according to Parsi someone else is always to blame. In Parsi’s worldview, the Iranian regime’s sponsorship of terrorist groups such as Hezbollah is not to blame. Nor has been the arming of Shiite militias in Iraq or Houthi rebels in Yemen. Neither can blame be laid at the launching pads of dozens of ballistic missiles fired off by the Iranians, nor their leaders’ threats to blast its enemies out of existence. In his statement, Parsi also takes a stab at the president and his son-in-law, Jared Kushner, who has developed a close relationship with bin Salman. Parsi claims that the Saudis are eager to start a war against Iran using American service personnel. It’s frankly an absurd claim since no one, not President Trump, nor the Saudi royal family, have ever mentioned a war or the prospect of one. 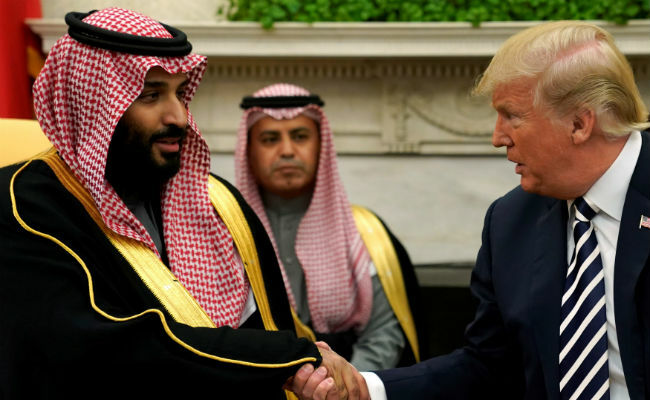 In fact, the U.S. and Saudi Arabia have started and participated in nearly a dozen peace initiatives aimed at defusing the conflicts Iran has started included several peace conferences aimed at halting the bloodshed in Syria and in each case, Iranian regime’s reluctance to accept any terms that diminish its military or political advantage have torpedoed all of these talks. In fact, rather than turning to the U.S. for help, the Saudis have taken it upon themselves to fight against Iranian-backed Houthi incursions along their border, as well as use their own navy to intercept Iranian fishing vessels trying to smuggle fresh arms into Yemen. The portrayal of the Saudi position towards Iran by the Iran lobby is just more evidence of the effort to throw smokescreens up at any effort to affix blame on the Iranian regime for the chaos enveloping the Middle East. It is also a recognition that the new world order in a post-Obama world has changed radically. No longer is the U.S. content to try and appease the mullahs in Tehran. No longer will the U.S. bind itself to a flawed nuclear deal that did not attempt to rein in the regime’s ballistic missile program or fundamentally abusive human rights record. Most importantly, the Iranian people themselves are expressing their own frustrations and desire for change in their oppressive government as protests have swept the country before being ruthlessly put down; crackdowns that drew almost not a whisper of protest by NIAC ironically. The Saudis know the Iranian playbook because they have seen it put into effect in Lebanon and Syria where Hezbollah was built into a powerful military proxy that eventually served to take over both countries. All of which rightly worries the Saudis in Yemen as Iran looks to create another Hezbollah with the Houthis it backs. A viewpoint shared by Prince Khalid bin Salman, the Saudi ambassador to the U.S. He told CNN that Iran wants to destabilize Saudi Arabia, and that it poses a threat to the entire region and international security. It is ironic that while Saudi Arabia is moving to open up the Kingdom to benefit women and seek diplomatic overtures to contain the Iranian regime, the regime keeps oppressing its citizens and uses terror and military force to achieve its aims.